Today I went into town to buy some supplies. The day was sunny and clear, with a hint of spring in the air. It was a perfect day for a drive! The mountains that ring our valley were white with fresh snow and incredible to behold. One particular mountain always captures my eye. It is visible only from certain angles, hidden the rest of the time by other peaks. 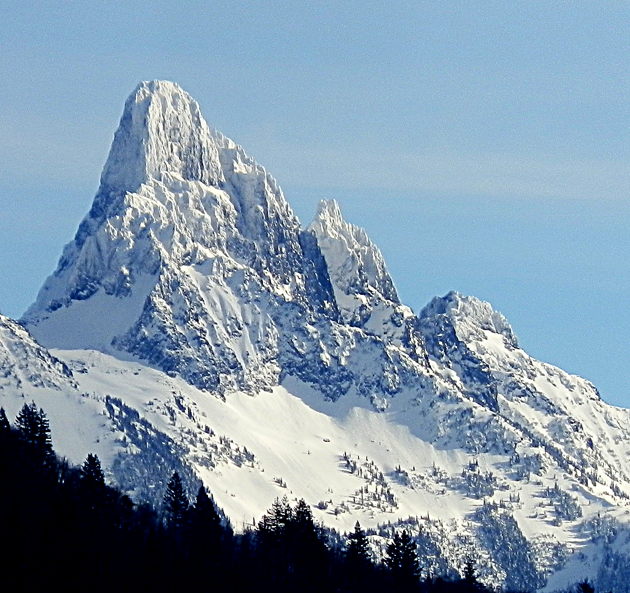 Mount Slesse is some miles distant, southeast of town, near the USA border. I snapped this picture this afternoon with my little point and shoot pocket camera from the parking lot of the fabric store in town. It is right out of the camera - no stretching or fakery here. This mountain is spectacular!